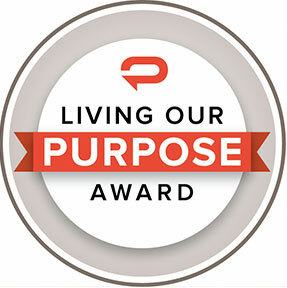 MINNEAPOLIS (October 31, 2017) – For the fourth consecutive year, Padilla has recognized employees who have made outstanding contributions to the agency with the Living Our Purpose Awards. Winners were selected in one of three categories – Client, Culture and Community. Each winner received an award of appreciation and a cash stipend. A senior director in Padilla’s Manufacturing Practice in Minneapolis, Danielle Engholm helps technology and manufacturing companies, such as Rockwell Automation, communicate complicated technologies to key audiences. Colleagues recognized Danielle for her impeccable ability to consistently bring new ideas and fresh thinking to her client engagements. Michelle Amoroso, a director in Padilla’s New York office, works across the agency’s Consumer and Food + Beverage Practices. Known for her high-quality work, Michelle was recognized with numerous national and regional awards in 2017 for work with Niagara Conservation and the U.S. Highbush Blueberry Council. Tina Charpentier is a senior vice president and leader of the agency’s Agriculture + Environmental Sciences Practice. Along with managing some of Padilla’s largest clients for the past several years, Tina was recognized for her strong leadership skills and mentoring she provides to her team. She works from Padilla’s Minneapolis office. Laura Campbell, is an account executive for FoodMinds, a division of Padilla, and works from the agency’s Chicago office. She was recognized for her volunteer efforts with Metro Achievement Center for Girls, where she serves as a tutor. Metro is a supplementary after-school program that serves fourth through 12th grade students from low-income families in the city of Chicago. It provides academic enrichment, character education, individual attention and extracurricular activities for students, and parenting skills classes and discussion for the parents. Padilla is a top 10 independent public relations and communications company comprised of 240 employee-owners. Padilla builds, grows and protects brands worldwide by creating purposeful connections with the people who matter most through public relations, advertising, digital and social marketing, investor relations and brand strategy. Padilla includes the brand consultancy of Joe Smith, the food and nutrition experts at FoodMinds and the research authorities at SMS. Clients include 3M, Barnes & Noble College, Bayer, Blue Cross and Blue Shield of Minnesota, Hass Avocado Board, Land O’Lakes, Mayo Clinic, Prosciutto di Parma, Rockwell Automation, U.S. Highbush Blueberry Council, the Virginia Lottery and Welch’s. Padilla is a founding member of The Worldcom Public Relations Group, a partnership of 143 independently owned partner offices in 115 cities on six continents. Make a connection at PadillaCo.com.